Looking for an accounting and bookkeeping solution for your small business? It is often hard for business owners to find software that meets all of their business requirements, as well as their budget. However, there are tools out there. We have put together a list of 10 software products that can help your small business succeed. We’ve looked for software that is user-friendly and intuitive. With the exception of QuickBooks Pro, all are cloud-based and offer monthly subscriptions. QuickBooks Online is a solid accounting software with a number of great features. It was built to be intuitive and easy to use. Setting up an account is simple. The interface is laid out in an organized fashion, making it easy to find whatever you are looking for. All-in-all, the software doesn’t require you to have accounting experience. 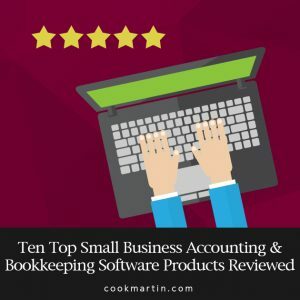 While QuickBooks Online isn’t as powerful as QuickBooks Pro (reviewed later), it has everything a small business needs and is cloud-based. The company updates the software regularly, with new features being added all the time. One disadvantage of this program is the customers service, which is rumored to be sub-par. QuickBooks Online offers a three-tier pricing plan and includes a free 30-day trial. You pay monthly (although annual payments will get you a discount) and can cancel your subscription at any time. Simple Start ($12.95/month): Create invoices and estimates, plus reconcile bank transactions. You are limited to one user, and you can share data with up to two accountants. Essentials ($26.95/month): You can have up to three users with this package, and you also get an accounts payable function to track and pay bills. Plus ($39.95/month): Receive added inventory support, plus you can prepare 1099s. You may add up to 5 users with full functionality, plus unlimited users who can only view reports or edit time sheets. Xero's cloud-based program features account management, invoices, billing, expense reporting and payroll. It also integrates with 400 other applications, allowing you to add functionality based on your needs. The interface is clean and user-friendly. The company updates the product every 3-6 weeks based on user feedback through their community forum. They also have good customer service. Xero is headquartered in New Zealand, but supports customers in the United States. Since the software is cloud-based, there is no hassle of downloading a program to your computer. The company caters to small to mid-sized businesses. In 2015, it won the CPA Practice Adviser’s Reader’s Choice Award for Best Online Invoicing/Bill Payment Solutions. The full-version of Xero is free for 30 days. After that, there are three pricing tiers. You pay monthly, and you can cancel anytime. Starter ($20/month): Recommended for freelancers, the starter tier allows you to process 5 invoices and 5 bills every month. You can also reconcile up to 20 bank statement lines. 1GB of online file storage is included. Standard ($30/month): Suitable for small businesses, the standard tier allows the user to process hundreds of invoices and bills, plus reconcile weekly bank statements. You can also process payroll for five employees and receive 5GB of online storage. Premium ($40/month): In addition to everything in the standard plan, you get support for multiple currencies and increased online storage. Zoho is a suite of products that businesses can use that includes Zoho Books. It has a growing focus on SaaS for small to mid-sized businesses. Zoho Books was launched in 2011, and has changed rapidly over the last few years to meet the demands of its clients. While Zoho has all the applications a business could need, their integration with other apps outside the Zoho family is not that great. The Zoho Books software itself is still missing out on payroll and job costing features. However, its invoicing feature is among the best in the business. It serves well as an accounting and invoicing solution for small businesses. There are three pricing tiers available after a free 14-day trial. As with most SaaS products, there is no contract and you pay as you go. Basic ($9/month): This includes unlimited invoices, as well as estimates and expense tracking for one person. You can also add an accountant to review your accounts and store up to 25 contacts. Standard ($19/month): This version includes an accounts payable function and multi-currency capabilities. You can also add two more users and up to 500 contacts. Professional ($29/month): Subscribers get added support for inventory and purchase orders. Plus, they can add unlimited users and contacts. FreeAgent's software is simple to use. The program allows small business owners the ability to handle their own finances. It offers double-entry bookkeeping along with basic expense tracking and invoicing software. Setup is quick, and you can be sending your first invoices out in minutes. There are automated invoicing options available that can help you save time, and they have a generous referral program available to users. FreeAgent was developed by a freelance IT consultant. In 2013, FreeAgent won the Software Satisfaction Awards for Small Business Accounts as well as Expense Management. While initially targeted at UK users, the company now also has a US version available. There is a free 30-day trial. There are no contracts, and you can cancel at any time. For customers in the United States, the plan is a flat $24 per month. This includes all features and services. Different countries have different pricing plans, so remember to check the website for the most updated information. Wave Accounting, a cloud-based program for small business accounting, made its appearance in 2010. Unlike the other market players, the software is free for use. The company intends to make small-business accounting fast and simple. Over the last few years, Wave has added an iPhone invoicing app, customer statements feature and has improved its payroll features. The software focuses on businesses with under ten employees. Since it is free to use, it does lack some features you’d find in paid software. Wave Accounting is free to use. It is supported by advertisements within the program. Sage started off as a single accounting program and, while the company has grown immensely since it started, they continue to provide an innovative accounting product. Sage One is the most basic accounting program offered by Sage. Focused on simplicity, this program has some of the best reporting and sales tax features available. However, some features, such as recurring invoices, are missing. Also, it is not yet possible to export your information should you ever decide to switch software. The free version of Sage One offers a limit of 5 invoices per month and one live bank feed. Sage One has one paid pricing plan at $10 a month for customers in the United States. This version offers all of the features, support and automatic updates to the software. You do need a credit card to activate the service. Payment is month to month and there is no contract. QuickBooks Pro is the desktop software offered by Intuit. While the company now pushes their QuickBooks Online software, QuickBooks Pro has its own core user base who loves its features and layout. Long considered a gold standard in accounting software, it offers solutions to companies that most cloud-based software cannot meet. While the software is more complex than most cloud-based software, it also directly installed onto a computer. This means that there is just the upfront cost of the program itself. It is considered one of the most feature-rich software programs out there. Remember that since it isn’t cloud-based, you can only access it on a single computer. QuickBooks Pro costs $299.95. There is no free trial available to test the software before buying. However, they offer a 60 day guarantee. This also means that future updates are not included. Furthermore, support is limited and you must pay extra to get additional support. FreshBooks was one of the first cloud-based accounting software programs to make accounting easy for the average person. Before it launched, most accounting software used the same complicated accounting language only understood by those working in the world of finance. The user interface of FreshBooks is easy to understand and visually pleasing. While FreshBooks started as invoicing software, it now offers expense and time tracking, financial reports and has integrations you can add on to increase functionality. FreshBooks offers a free 30 day trial. After that, there are four plans to choose from. All plans include invoice tracking and customization as well as rock-solid security. Sprout ($9.95/month): Unlimited invoices, expense and time tracking. You can bill up to five clients. Seedling ($19.95/month): Everything included in Sprout, but you can bill up to 25 clients. Evergreen ($29.95/month): Everything included in Seedling, but you can bill unlimited clients. You can also add one staff member, team time sheets and track expenses and revenue by staff member. Mighty Oak ($39.95/month): Everything included in Evergreen, but you can add up to 5 staff members. Less Accounting grew out of frustration at the types of financial management software available on the market. While Less Accounting software lacks QuickBooks Online’s elegance and features, it isn’t trying to compete with QuickBooks. Instead, Less Accounting considers it an alternative for businesses that only need the most basic accounting features: income and expense tracking, invoices and proposals, mileage tracking, reports and double-entry accounting. It also offers integrations with financial institutions. Less Accounting has three payment tiers. Kashoo was created when founders Dobes Vandermeer and May Chu decided to make a simpler solution for small business accounting. Kashoo aims to be simple. They provide basic accounting features and want to make it simple for business owners to handle accounting themselves. They offer features like bank imports, reporting, invoices and expense reporting, cash flow, payroll integrations, tax reporting and data exports. It is the perfect software for businesses that do not need inventory management within the software. Kashoo offers a 14 day free trial with no credit card required. You pay month to month and can cancel at any time. They only have one payment plan, at $12.95/month. This gives you full access to the application. Choose your accounting and bookkeeping software with care, as it can be hard to move from software to software without losing data. Your accountant can help you pick a software program that best fits your needs. Need help with your accounting solutions? Click the button below and lets talk. 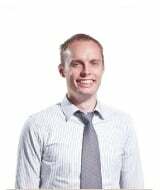 John Kane is a CPA in the Logan office of Cook Martin Poulson, PC. John enjoys interacting with clients and working with them to create solutions to problems.